Admiring the beauty of colorful flowers, enjoying an ice cream on a hot day, relaxing at the beach―why not bring all of these aspects of summer into your home during the warmer months? You can easily do this by adding home accessories that can be removed when the cooler weather arrives. Here are some ways to invite summer style into your home. Summer is the time when flowers are in full bloom, so bring the outdoors inside with floral home accessories. They will add splashes of color and nature-inspired interest to your home. In your living room, simply add several throw pillows with different floral designs to give the room a relaxed, lived-in feel. 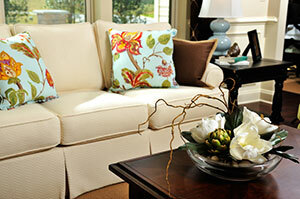 Create a unified look by choosing designs with similar colors. Botanical prints are on-trend right now and are perfect for bringing the summer into your bedroom. For a bold look that will draw attention to your bed, choose bed linens with a botanical print in bright colors, such as yellow or fuchsia. For a more subtle look that will create a relaxing ambiance, opt for bed linens depicting leaves or ferns in shades of green on a neutral background. If you like the vintage floral wallpaper that is popular at the moment, consider using it to decorate one of your rooms. If you are unsure as to whether the look would work well, you could try self-adhesive wallpaper. This can be easily removed when the summer is over or if you decide that vintage floral wallpaper does not suit the room. Also, covering just one wall with vintage floral wallpaper is a good idea if you think that the design would overwhelm the whole room. Decorating in shades of blue and white can give a fresh, breezy coastal feel to any room of your home. Although the bathroom is perhaps the most popular room to decorate with a nautical theme, you could also add pillows with blue and white stripes to your living room or bedroom, sea-green tableware to your kitchen, and pale blue placements to your dining room.